Last evening, I was roaming in one of the markets of my city where I spotted a shabby shop. I went inside and saw it had books everywhere. Old and new both. It took me seconds to figure out that the shopkeeper is selling old books at 50% price and there were hundreds of books lying around. 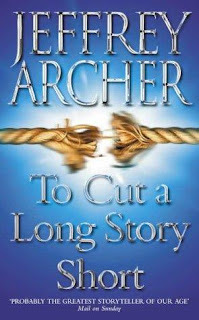 Yesterday itself, someone from twitter suggested me to read short stories by Jeffrey Archer after reading my review of "Only Time Will Tell" and also suggested me this title "The Twist in the Tale" but I forgot it and picked up "To Cut A Long Story Short" for mere 100 bucks in a superb condition and I am glad I did that. "To Cut A Long Story Short" is a collection of short stories that Jeffrey has collected and experienced while he was travelling around the globe. The book features 15 short stories out of which 9 are based on true incidents. This was actually the first time I was reading a book which is a collection of short stories so I was a bit skeptical before starting it. All the short stories have one thing in common, sudden twists and turns that would surely jolt you. The first two stories of the book namely Death Speaks and The Expert Witness, I had to read them twice because the language is so tricky that if you miss out on something, the story would sail over your head. But after that, I read all the other stories with patience and word by word. And I would advice the reader of the book to do the same. My personal favourites from this collection is, The Expert Witness, The Letter, Too Many Co-incidences, A Weekend to Remember and The Reclining Woman. I wont discuss the plots of these stories here but I highly recommend this book if you like intelligent and sly fiction. I would have loved 1-2 lines about most of the stories or atleast your favorite stories .. The reason YOU liked them !